In the mid-1960s Texas Instruments started a development project which led to the first prototype, and equally importantly the master patent, of a hand-held electronic calculator called the "Cal-Tech". Although Texas Instruments never sold this model it was developed in conjunction with Canon of Japan into the Canon Pocketronic, which was one of the first commercial hand-held electronic calculators. Issue No. 1 of "The International Calculator Collector" had a feature on the CalTech with a photograph on the front cover. That article is reproduced below. Few manufacturers were using integrated circuits—mainly defense companies that needed the miniaturization offered by an IC-based circuit and could afford the high design and manufacturing costs of this new product. TI President Pat Haggerty remembered the success his company had with another of their new products, the transistor, when TI developed a new consumer device to showcase its use—the transistor radio. Canon Pocketronic, based on the Cal-Tech, with integrated circuits by Texas Instruments. For more information see the Canon Pocketronic in this section of this site. The prototype calculator was shown to a number of business machine and electronic companies. Canon (Japan) became very interested in this new technology; seeing the potential of miniaturized electronics to help fuel their growth in the business machine market. Their Pocketronic, sold 3 years later in 1970, bears a striking resemblance to the original "Cal-Tech" and even kept its unique, horizontal-path, thermal printing tape system. Retaining the features of a standard electronic desk-top calculator that can perform 12-digit calculations, the adoption of tiny electronic marvels called the LSIs has greatly reduced the size of the calculating machine—so small that it can easily fit into a pocket. Canon, since marketing the prototype Canola 130 in 1964, has led the electronic calculator industry, introduced the Canola 161—the first electronic desk-top calculator equipped with a memory system—and IC-operated Canola 163, 162, and 141, besides the popularly priced Canola 1200 series. Canon has taken the role of a pioneer, creating the demand and ushering in the golden days of electronic desk-top calculators. But response from the retailers—Foley's of Houston and Sanger-Harris in Dallas—was little short of ecstatic. Says one "They seem more organized than most outfits in the business. They presented us with very detailed spec sheets and a better-looking machine—it's more streamlined and more tasteful than the Canadian and Japanese-made jobbies we've been selling." Adds the other: "At that price—$149.99—it should sell up a really big storm." For more information see the TI 2500 "Datamath" in this section of this site. Excerpted from a TI press release dated September 21, 1972 (some TI-3000 and TI-3500 information not reprinted here). The TI-2500 portable electronic calculator is a four-function, full-floating-decimal-point unit with an eight-digit light-emitting-diode display. With a suggested retail price of under $120, the TI-2500 calculator is rechargeable and capable of portable or ac operation. The TI-2500 unit uses algebraic entry—ideal for general public use. A basic patent for miniature electronic calculators has been issued to Texas Instruments Incorporated. The patent is for personal-sized, battery-operated calculators which have their main electronic circuitry in a single integrated semiconductor circuit array, such as the popular "one-chip" calculators. This was followed by major developments fundamental to MOS/LSI integrated circuitry—the basic technology behind today's miniature calculators. Two key patents on MOS/LSI were awarded to TI in 1972. The miniature calculator described in the new TI patent (editor's note—this was the "Cal-Tech") was the result of work done at TI in the mid-60s. The patent (Number 3,819,921), originally filed in 1967, was awarded to TI June 25, 1974. This miniature calculator (the world's first) employed a large-scale integrated semiconductor array containing the equivalent of thousands of discrete semiconductor devices. 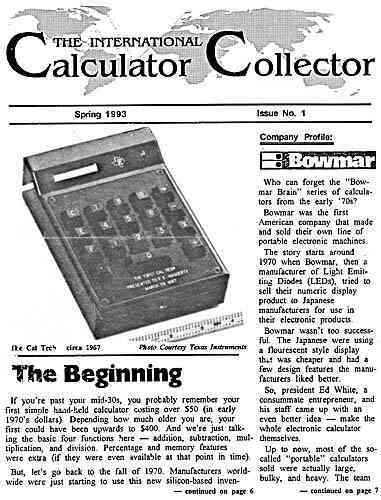 For more articles from "The International Calculator Collector" see the Collecting Calculators section of this site. 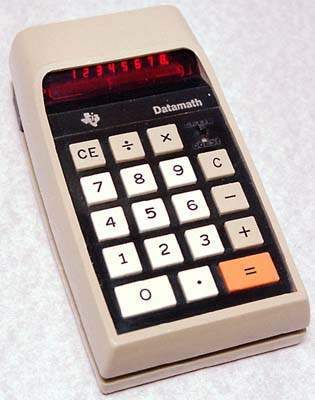 There is another detailed article about the development of the Cal-Tech calculator, with a number of photographs, in pdf format at https://www.dropbox.com/s/bwwc9q3y090d2r8/How_the_Computer_Got_Into_Your_Pocket.pdf. Further information about Texas Instruments and its calculators can be found in the Calculator Companies section of this site.